If your goal is to reduce your caloric intake and to lose weight, artificial sweeteners are not the way to go. We see many varieties of these so called “sugar substitutes” on the grocery store shelf. Most common are sucralose (Splenda), aspartame (NutraSweet, Equal, Sugar Twin) and saccharin (Sweet’N Low). 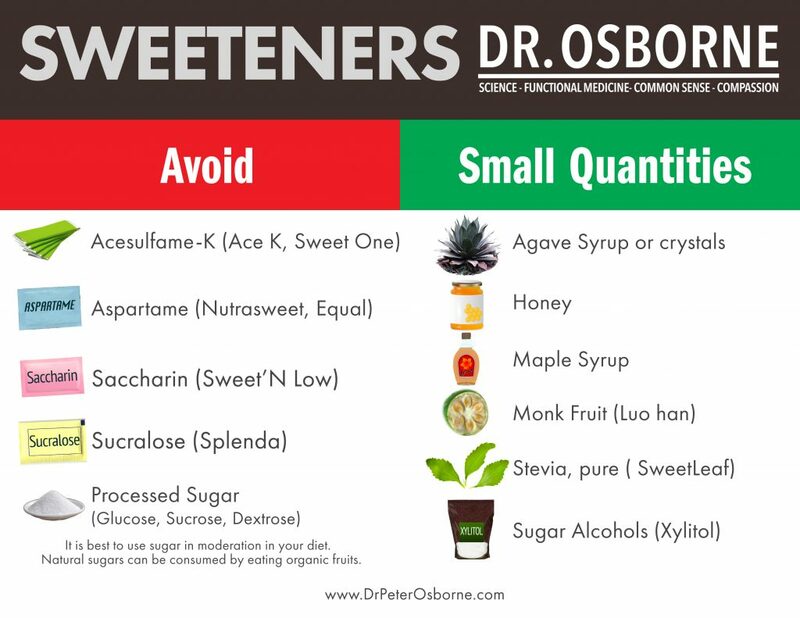 Consumers quickly reach for these artificial sweeteners in order to satisfy their sugar craving while ingesting little to no added calories. However, many consumers do not know the possible side effects and health risks associated with the ingestion of chemically processed artificial sweeteners. What products and foods contain artificial sweeteners? Many processed products contain these artificial sweeteners including chewing gum, breath mints, beverages, alcoholic beverages, dairy products, salad dressings, desserts, candies, gelatin, preserves, baked goods, toothpastes, mouthwashes, yogurts, vitamins, children’s vitamins, pharmaceuticals, breakfast cereals, snack foods, soups and tabletop sweeteners. For the average consumer, these sweeteners are not easily identified on a food label. Most processed products will be labeled “sugar-free”, but will contain an artificial sweetener. For those with grain sensitivities, manufacturers will utilize corn as fillers to make these artificial sweeteners, which can create an inflammatory response in the body4. All of these processed products containing artificial sweeteners will continue to mislead consumers if labels are not read carefully. What are the health risks associated with artificial sweeteners? Current research is limited on the beneficial effects and the long term health risks associated with the ingestion of artificial sweeteners. However, cyclamate (an early artificial sweetener), was banned by the FDA in 1970 due to carcinogenic risks in experimental animals. With this ban, the artificial sweetener market took a hit. Consumers were left scared knowing there could be a cancer risk associated with ingestion of artificial sweeteners. Shortly after, manufacturers replaced one toxic artificial sweetener with new equally toxic sweetener. Many consumers report headaches, dizziness, rashes, bloating, nausea, diarrhea, and digestive problems after ingesting artificial sweeteners. These side effects could build up over time and cause serious long term diseases with regular consumption of these processed sugars. In numerous studies observing weight loss with the ingestion of artificial sweeteners, there is not enough proof that consumption is beneficial in weight management2. Studies are able to show short-term weight loss, but lack any long term weight loss results. However, consumers are still consuming artificial sweeteners in order to reduce their caloric intake with the intent of weight loss based on physician’s recommendations. 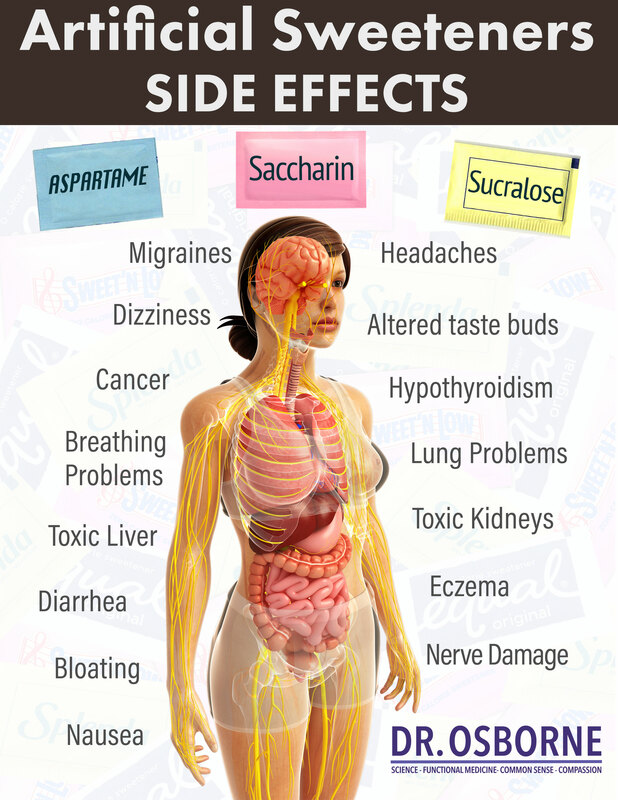 Artificial Sweeteners can also develop into an addiction. These processed sugars are 200-13,000 times sweeter than regular sugar5. Over time, the consumption of these artificial sweeteners can alter taste buds and result in a constant craving for foods that are overly sweet. More nutritious foods such as fruits and vegetables become less palatable, so less nutritious sugar-free substitutes and carbohydrates are consumed instead. Consequently, risks for nutrient deficiencies and weight gain increase. What kind of sweeteners are safe to use? In order to satisfy one’s sweet craving, utilize all natural sugars. These sugars include agave syrup or crystals, local honey, maple syrup, monk fruit (luo han), and Stevia (pure)4. These sugars are pure, made by nature not in a lab, and do not undergo the high chemical processing of artificial sweeteners. For optimal nutrition levels, sugars should be used in moderation, obtained by organic fruit consumption or eliminated from the diet. With all these mixed bags of information and lack of long term studies, we should steer clear of all artificial sweeteners. They are after all, processed products. Why take the unnecessary health risks consuming a product filled with chemicals, grain fillers, and a long list of side effects? If it’s a yellow, blue, or pink packet, throw it away! Or if packaged foods say sugar-free, leave it on the grocery shelf! It could be toxic! 2. Bruyere, O., et al. (2015). Review of nutritional benefits and risks related to intense sweeteners. Arch Public Health, 73(41). doi: 10.1186/s13690-015-0092-x. 4. Osborne, Peter. (2016). No Grain, No Pain: a 30-day diet for eliminating the root cause of chronic pain. New York, NY: Touchstone. 7. Whitehouse, C.R., Boullata, J., McCauley, L.A. (2008). The potential toxicity of artificial sweeteners. American Association of Occupational Health Nurses, 56(6), 251-259.